In the Bronze Age, Beijing was in the northern borderland of the Central Plains Dynasties. The bronze culture in the area shows a strong identity with Central Plains culture, as well as a distinctive aspects of multi-cultural fusion. In ancient China, jade was regarded as a magical object, later combined closely with the national character, cultural traditions and moral concepts of the Chinese nation. Stele calligraphy began to thrive in the mid-Qing Dynasty (1644-1911). In the latter half of the dynasty and the following Republic of China (1912-1949), calligraphic art drew artistic nourishment from the tablets of the Wei (220-265), Jin (265-420), Northern and Southern Dynasties (420-589), with great influence on style. Chinese painting art dates from prehistoric times. It was well developed in the period of the Wei (220-265), Jin (265-420), Sui (581-618) and Tang (618-907) dynasties and thrive even more in the period of the Song (960-1279), Yuan (1271-1368), Ming (1368-1644) and Qing (1644-1911) dynasties. This exhibition reveals the art history of Chinese Buddhist statues and Tibetan Buddhist statues, and the rich Buddhist culture in Beijing. 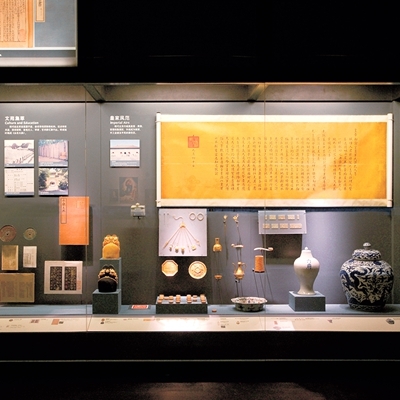 This exhibition fully displays pottery and porcelain wares inherited or unearthed in Beijing. 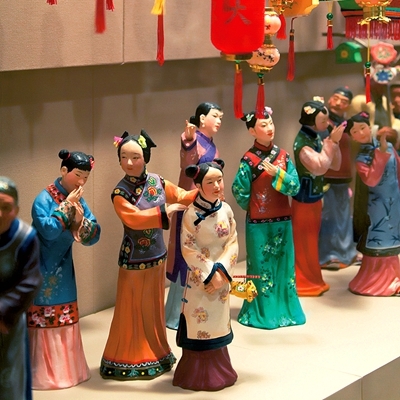 It reveals the process of Chinese ceramic art development and the history of Beijing. Buddhism born in ancient India in the 6th century BC was officially introduced into China in 2 BC. In the period of more than two thousand years, Buddhism in China formed the Chan School, Pure Land School and many other sects with Chinese cultural characteristics and created a variety of art forms and exquisite works, in the areas of architecture, sculpture, painting and so on. It has become an important part of Chinese traditional culture. Focusing on its rich culture, this exhibition chronologically displays the historical development of Beijing, from a primitive residence place to the formation of a polis, from a political center of North China to a united multi-ethnic feudal state, and to the capital of the People's Republic of China. The theme of this exhibition is "Life in Hutong." By displaying the scenes of wedding, birth giving and festivals among the ordinary people living in Hutong, it portrays a vivid close-up on customs and rituals of the people's life in Beijing tracing back history to late Qing and early Republic of China period.